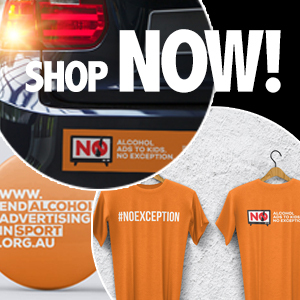 The current review of New South Wales liquor law reforms, introduced in February 2014, has generated heated debate, and a good deal of misinformation. This week on Drink Tank we continue to highlight key submissions to the Independent Review, separate the fact from the fiction and make the case in support of the measures. In today’s post, Sydney local Julian Ardas discusses how the one constant in the cultural melting pot that is Kings Cross is change. The Kings Cross locality is a unique and fascinating urban area in Australia. In the 1920s the area embraced the elevator and created high rise and high density apartment buildings and, for a very long time, the area held the title of the highest density residential population in Australia. Kenneth Slessor, one of Australia’s leading poets, in a book published in 1965 titled Life at the Cross described Kings Cross as “one of the most thickly populated focal points of white men’s habitation on the face of the earth. The curious, haunting, exciting, brassy flavour of the Cross, a mixture of Montmarte, Chelsea, Greenwich Village transplanted to the southern hemispheres”. The area’s modern history is also shaped by a vast array of cultural occurrences and collisions to create a unique and variegated chemistry of truly urban living: sailors, servicemen, restaurants, fashion designers, boutiques, modelling agencies, delicatessens, immigrants, tourists, The Beatles, Lee Gordon, Abe Saffron, Billy Thorpe, Surf City, The Easybeats, Albert Records, ACDC, Juanita Neilson, Green Bans on Victoria Street, William Dobell, Jeffrey Smart, The Yellow House, Minerva Theatre, Chrissie Amphlett and The Divinyls, The Manzil Room, Bourbon & Beefsteak, and the 1995 Wood Royal Commission into Police Corruption. It is a highly diverse urban area that has a long history of inclusion and tolerance through the co- existence of many different lifestyles, nationalities, sexual orientations, socioeconomic conditions, personal circumstances, professions, personal services, social services and human interactions. The one constant in this cultural melting pot has been change. So it’s well worth examining how it has changed in recent decades. 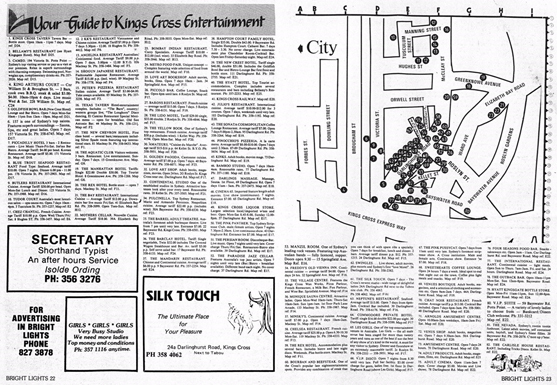 An entertainment guide published in 1980 shows the locations and details of 82 entertainment establishments in the Kings Cross locality. Image sourced from the Stations of the X Facebook page: KINGS CROSS ARTICLE SERIES #73 – 1980 bright lights magazine guide to entertainment in the x pins down a lot of addresses. How many of those establishments were open until 3am or very late, and what do we know about the types of venues? In fact, only 14 of the total 82 entertainment establishments (17 per cent) were advertised as open until 3am or until very late. Just as interesting, only five venues (six per cent of the total entertainment establishments) were music/alcohol venues. Fast forward 25 years. A proliferation of Development Applications (DA) for Liquor Licensed Premises were approved from 2005. Community groups constantly stated that this would lead to a saturation of licensed premises in the Kings Cross locality. However, such warnings were not taken seriously and treated by the approval authorities as simply a point of objection by a ‘NIMBY’ (not in my back yard) community. During this time, there was an increased corporatisation of the liquor industry. The Westpac Bank Building conversion by the Keystone Group mimicked their East Darling Harbour Bungalow 8 and the Cargo Bar liquor licensed premises. These large facilities are designed to attract many patrons and require a wide geographic audience. They are not designed to rely on only local demand. During the DA process, a requirement was imposed on the Keystone Group to hold community information sessions. They were held in the Sugarmill Hotel and deliberately stacked with alcohol-fuelled hecklers insulting and intimidating the local community members in attendance. It certainly seemed that Keystone Group clearly had no interest in being a good corporate citizen or integrating with into the existing community. The peak popularity of the Cross in terms of sheer numbers of patrons coincided with the highly popular Channel 9 television series Underbelly screened between 2008 and 2013. This series sparked much interest in gangster history, the Kings Cross area and its corrupt past. At its worst, the Cross was totally wild and virtual lawless from Thursday to Sunday nights. Kings Cross was described by the MP for Wentworth (now Prime Minister), Malcolm Turnbull on 24 April 2012 as a “war zone”. With major event-sized crowds of young people, many already affected by alcohol, and with minimal crowd management and controls in places, altercations and conflicts were common. The City of Sydney Council recorded counts of 19,000 pedestrians per hour along Darlinghurst Road from 12am to 2am on weekends (equivalent to Martin Place weekday lunch time pedestrian numbers). Bayswater Road was also heavily trafficked with pedestrians and vehicles. The presence of police and security staff did very little to appease the crowd. Plans of Management as a condition of approval upon licensed premises were ineffective and did not work. Young people generally from 16 to 25 years of age who came to Kings Cross were hell bent on ‘getting smashed’. A mono-culture of liquor licensed premises prevailed. Night time noise levels from Kings Cross were very high and sleep disturbance was a significant problem. King hitting and fighting became the new night out for some groups of new age Neanderthal blokes. A new generation of coward punching thug emerged (akin to the former gay basher of the 1970s and 1980s). The only difference: any innocent person was now a target. The morning transition period, when early risers met late-night revellers was a very frightening time in Kings Cross. Being accosted by groups of young drunkards when you are going about your own early morning business, such as going to work, travelling or exercising, was a most confronting experience and one you never forget. Those mourning the ‘loss’ of the Cross’s cultural and creative essence, should be reminded that during this era, it simply did not exist. And now the Cross is changing again. It is impossible to not see that change as positive. Life is returning to the Cross. The success of the modest trading hour reductions in reducing harms and increasing community safety are undeniable. But good business operators are also benefitting too. People are coming out earlier. Many new and exciting restaurants, cafes and bars based on creative and fresh approaches have opened, attracting locals and visitors alike, with a new clientele emerging. Many successful business operators in the Kings Cross openly admitted that you must cater to changing tastes and changing times. And in Kings Cross, change is the one constant. It is very refreshing to consider the views of a legitimate long term local resident who prefers fact over fiction, industry scaremongering, political dross and the poorly informed hysteria that is increasingly proven to be misleading and deceptive. Public safety can never be allowed to be debased or become a mere “popularity contest”- reliant upon how many social media savy hypsters and industry supporters can round up acquaintences including those from overseas to crash polling and submit form based submissions. 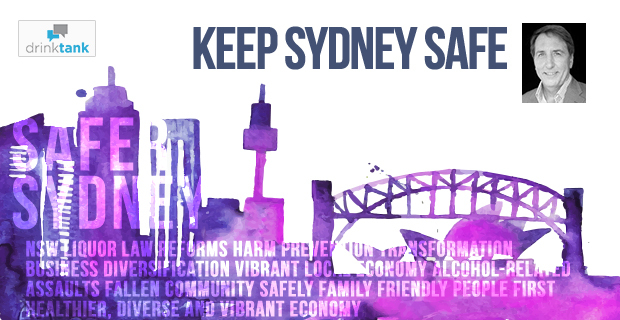 Public safety evidence shall prevail and lead us down the positive pathway created in Newcastle where after 8 years – more than halved assaults – more than 2x licensed premises and more jobs – a win-win-win outcome eminently transferable to Sydney. There has never been a more important time for the charities sector to plan for the future than now, writes Community Council for Australia CEO David Crosbie.